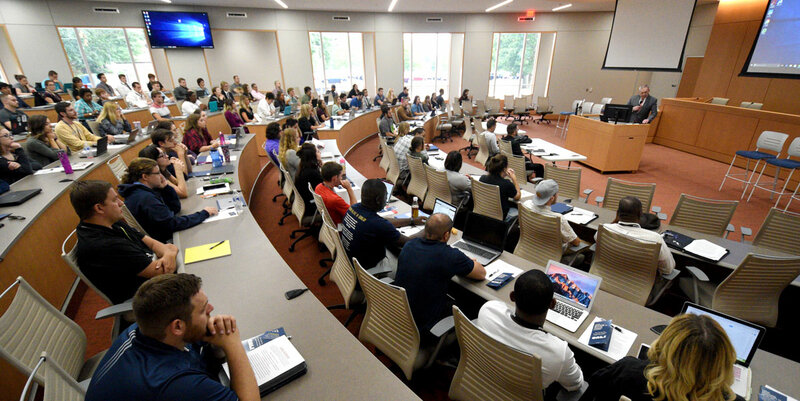 THE SCHOOL OF LAW is starting the new fall semester in a completely renovated C. Blake McDowell Law Center. Designed by RCG Architects, the 107,584 square-foot building includes a new 12,350 square-foot west wing addition, bringing together a student population of about 500 and full-time faculty and staff of nearly 60. The $21 million renovation is debt-free, thanks to more than a decade of planning and saving, and to the generosity of hundreds of private donors. While the idea dates back more than 10 years, renovations began in late 2015. Seeing the project come to fruition creates a sense of pride in all members of the Akron Law family, according to the law school’s new dean, Christopher J. (C.J.) Peters. The renovated McDowell Law Center contains cutting-edge technology throughout the building. 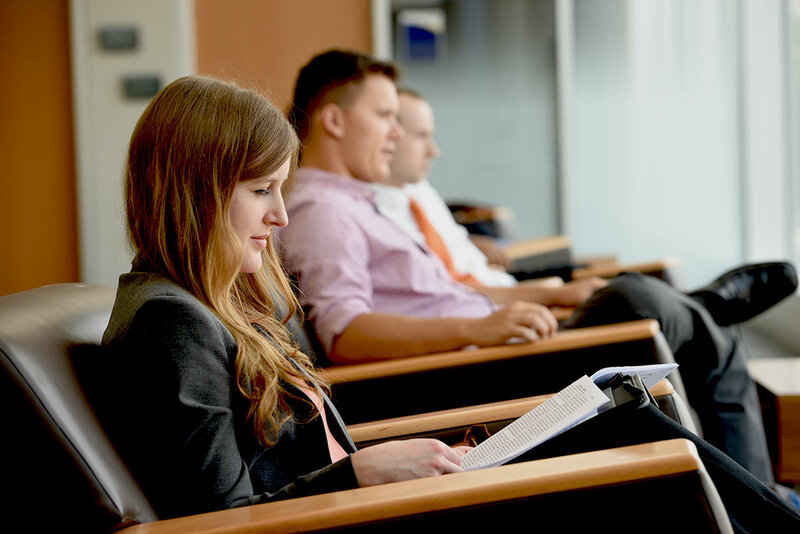 Features include the innovative David and Ann Amer Brennan Courtroom, plentiful study and meeting spaces, a café, expanded student services, and the two-story Beatrice K. McDowell Common for gatherings, events, and informal student use. Classrooms range in size and configuration, providing plenty of flexibility for different styles of teaching and group study needs. Classrooms and courtrooms are outfitted with sophisticated technology for instruction and student use. Even the study rooms have large digital screens, enhancing collaboration. In the new west wing addition, the jewel is the 125-seat David and Ann Amer Brennan Courtroom that features fully integrated technology and live-streaming capabilities. Floor-to-ceiling windows imbue the space with natural light. The Tzangas Plakas Mannos Judge & Jury Suite includes judge’s chambers and a jury deliberation room adjacent to the courtroom. The Beatrice K. McDowell Common is a large two-story atrium for gathering, study and event space. Glass study rooms with teleconferencing ability line the first floor along one side. A café and lounge area is adjacent to a new courtyard. A gaslight fireplace encourages conversation and collaboration. A smaller law library made room for a larger career services suite, an academic support suite, and more collaborative spaces for students. Faculty offices, once scattered, are now consolidated on the second and third floors with shared copy/work rooms and collaboration areas that are easily accessible to students. The Akron Law Veterans Lounge is also nestled near the library. The Lawrence A. Sutter, III Practice Courtroom is named for an Akron Law alumnus who coached the school’s successful trial advocacy teams to four national championships and 18 regional titles. 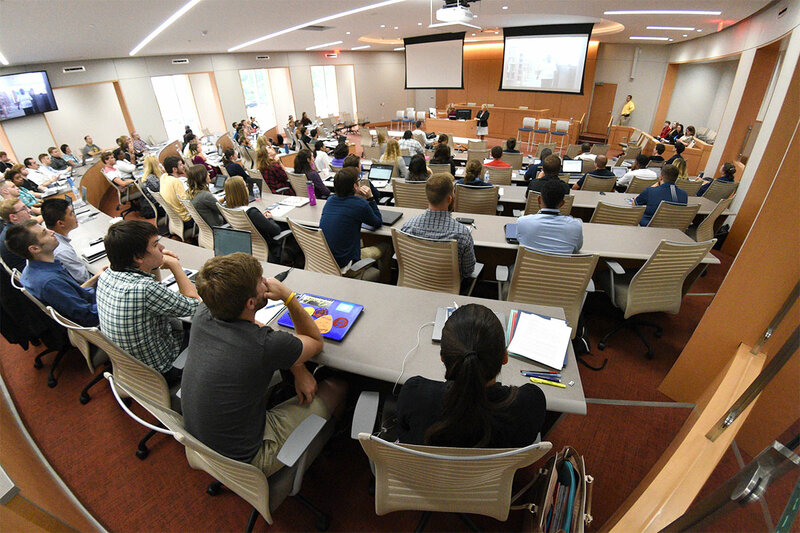 “It is a terrific space that will be used often by trial advocacy classes, and will certainly serve as the central hub for our team’s mock trial practices,” says Evans. Two new 75-seat, circular, state-of-the art classrooms with video conferencing will enable distance learning both domestically and internationally. In fact, President Matthew J. Wilson teaches an International Business Transactions course each year that provides an opportunity for Akron Law students to engage in cross-border learning exercises and simulated negotiations with South Korean law students at Kyung Hee University. This course supplements Akron Law’s unique Asian study abroad program, which allows students to spend a summer learning the law in three different cities in two Asian countries. The second floor has new study spaces, new flexible classrooms and a renovated space dedicated to the Center for Intellectual Property Law and Technology; Center for Constitutional Law; and Joseph G. Miller and William C. Becker Center for Professional Responsibility. 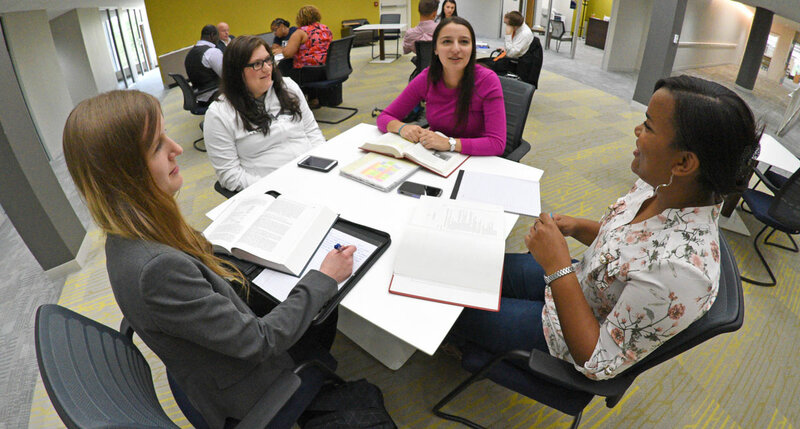 Akron Law’s nationally renowned legal clinics have new offices and client meeting space. “With the support of our alumni and the legal community, the University has built something that will impact legal education in the area for decades to come,” Wilson says.